Hey Don’t Wait … I Got An Idea! After pondering the topic I had this realization … ideas are simply thoughts that when acted upon, materialize in the physical world. For example, the Empire State Building was just an idea that formed in someone’s mind. It took action and a whole lot of collaboration to make it come to life. 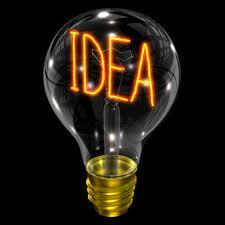 How many times have you had a brilliant idea Â … THAT YOU NEVER TOOK ACTION ON? It is the actions that you take that bring your ideas into existence and sometimes taking action is the only thing Â holding you back from being more successful. Just think if Nicolas Appert never invented the idea of canning food in 1809, Ezra J. Warner might not have been the one to invent the can opener in 1858. Both of these inventions were simply ideas that were acted upon. So the next time you have an amazing idea … ACT and act fast. The longer you wait the greater the probability that you will never bring your idea into existence … and someone else will. So what amazing ideas have been rolling around in your mind lately? And you were waiting for what … ? PreviousPrevious post:Customer Loyalty: “Let Me See if I Understand You …”NextNext post:When I Grow Up … Making Your Dreams Come True!